thredUP offers Tiny Green Mom readers a special deal to celebrate their first Earth Day and reward green behavior! thredUP members can earn a $5 credit for listing a box of kids clothing online! What is thredUP? It’s a place for frugal, busy and green moms to conveniently swap boxes of kids clothes online. What can I do on thredUP? Swap: Like Netflix, you can choose a box of gently used clothes you’d like to receive. Then, similar to eBay, you build virtual boxes of clothes that your kid no longer wears. Finally, like StubHub, thredUP enables and manages exchanges. Our marketplace facilitates exact matches, ensures quality, and remedies the lack of coordination that plagues offline clothing swaps. Exchange with Friends: We want to make swapping with your friends easier without a price tag. Your thredUP “Inner Circle” allows for online exchanges with close friends. You can bring local friends into this group or reconnect and trade with long distance friends. Go Green: Collectively, Americans discard two quadrillion pounds (that’s a two with fifteen zeros) of used clothes and textiles into landfills each year. thredUP lets you “up-cycle” your child’s wardrobe. By sharing what we already have, parents can make a huge step towards sustainable living. Save green and go green by swapping with like-minded moms. Sell: thredUP allows you to sell boxes of clothes for cash. Tell us about the gently used items your kid no longer wears. We’ll send you boxes and schedule the pick-up. Soon enough the clothes are out of your hair replaced by money in your pocket. Buy: No need to spend hours digging through consignment stores or hundreds of dollars in Baby Gap. Head to thredUP and browse boxes of kid’s clothes. With 10 or more items in each box, thredUP makes it easy to buy quality clothing in bulk. Only 15 days left! Tiny Green Mom readers have been offered an exclusive discount code to be used when purchasing any of Sama Baby’s gorgeous organic clothing pieces online! To receive 10% off your next purchase, please use the following code: TINYGREENMOM10. Good through April 30, 2010. Bright Baby Tees (BBT) – a smart, organic clothing line that is comfy for mom, dad & caregivers AND visually engaging for junior! Yes, that’s right! Touted as “smart, simple, safe and sustainable,” these affordable, eco-chic tees offer stimulating, eye-catching designs on the front for your child. Each t-shirt is printed with non-toxic inks and features original educational infant visual stimulation (IVS) designs. Bright Baby Tees make a great gift for the new parent or the seasoned parent, and are available in a variety of interesting designs and bold colors online at www.brightbabytees.com. Sama Baby’s organic denim line will be exploding onto the children’s fashion scene in March 2010 and will be available nationwide just in time for Earth Day, April 22nd, 2010. 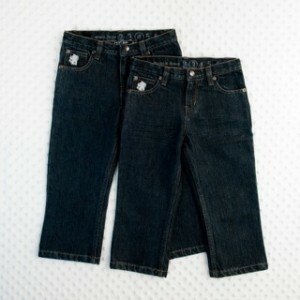 Their jeans are high quality, organic, and affordable, much like the rest of their line, and are priced at $40 a pair. Visit www.samababy.com. Tiny Green Mom readers have been offered an exclusive discount code to be used when purchasing any of Sama Baby’s gorgeous organic clothing pieces online! To receive 10% off your next purchase, please use the following code: TINYGREENMOM10. Happy shopping! http://tinygreenmom.com/wp-content/uploads/2018/07/logo-sm.png 0 0 Tiny Green Mom http://tinygreenmom.com/wp-content/uploads/2018/07/logo-sm.png Tiny Green Mom2010-04-01 06:00:452010-10-11 11:13:11Sama Baby Launches Denim Line for Earth Day! Your little girl will love to kick around in these super stylish, 100% Organic rib cotton Girl’s Pants w/Skirt! Lightweight, comfy, and amazingly soft, these pants are perfect for Springtime fun. With an adorable ruffled skirt and trim, the pants are available in 4 sweet colors. $23.00 Find these pants plus other matching tops, rompers, and bodysuits on www.BNatureOrganic.com. For a 10% discount off any purchases at B Nature, please email [email protected].